The Sutter Creek Theatre professionally presents contemporary and traditional music, theatrical works, dance, film, and other artistic events that are engaging to a diverse regional audience. A former silent film theatre, the venue comfortably seats 215 people. Because it was designed for viewing film, all of the seats have views of the stage. The original art deco ceiling designs are intact, and were the basis of our logo. We have a balcony, and the original theatre seats (complete with hat racks underneath!) The theatre is renowned for its excellent acoustics and intimate seating. We offer beer and wine, and other beverages and snacks. The theatre building is also home to Heart & Soul, AT 42 Main, offering unique home decor, jewelry, chalk paint and more. You can also buy tickets to Sutter Creek Theatre shows at Heart & Soul, open 11-5 daily. Also located in the theatre building is Uphill Vineyard’s tasting room where you can sample their excellent wines and buy a bottle or a case. A Great History – Over 95 Years! 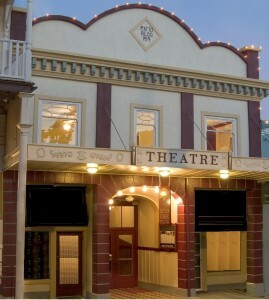 Located in the heart of the Mother Lode, the Sutter Creek Theatre has survived a tumultuous history. Its wooden predecessors rose repeatedly out of the ashes of the town’s early-day fires. In the 1860s a saloon and billiard parlor was located on the site. But repeated fires in 1862, 1865, 1868 and 1888 destroyed it and any other wooden shops there. By 1912 the site held a saloon, barber shop, and bocce ball court. Around 1912 John F. Ratto, a Sutter Creek merchant (who was also the county’s Hupmobile dealer), opened a silent-movie house in the 1850s vintage brick building now known as the Bellotti Inn across the street from the site of the soon to be built Sutter Creek Theatre.